Now Shaun does some stuff with the neck and head that contradict what Tony Horton teaches, but that might just be a different philosophy of fitness. The two workouts are pretty good. I broke a sweat on each. I can see why Shaun T's stuff is so popular. It is high energy, musical, moving and grooving. This video will also be a good progression for children as they outgrow Tony and the Kids. Nick Bland has created a wonderful book about understanding and being different in this fun book. The artwork has a look and feel reminiscent of M.C. Escher - a classic pen and ink style, predominantly black, white and grey, except for selective color to highlight or contrast. The story is just as wonderful. A young boy receives a letter from a monster, and decides to write back. 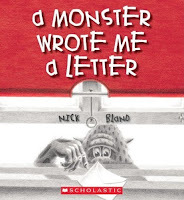 The monster, upon receiving the letter, realizes that the boy got the letter not his cousin Fred, who lives under the boy's bed, so he decides to meet the boy. Both the boy and the monster try to make the other welcome. The boy spooks up the place and the monster cleans up. They have a great day together. It is a fantastic book for children of all ages. Tony has kids twisting, stretching, moving and grooving. The video will help children develop coordination, flexibility, strength and establish fitness habits. There is a bonus chat about nutrition and fitness between Tony and the kids at the end of the workout. 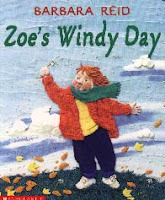 Zoe's Windy Day is part of a series that includes Zoe's Windy Day, Zoe's Sunny Day and Zoe's Rainy Day. Zoe is going for an outing on a windy day; she and her father go for a walk. They watch the leaves blow down the street, and they feed squirrels in the park. Her cheeks become very rosy walking against the wind on the way home. Then she and her father sit snug and cozy inside, sipping hot chocolate after a windy day of exciting activity. 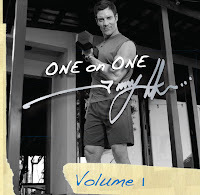 I have been working out with Tony Horton for 120 days at the writing of this. I have done a full round of P90X, and am now doing a custom P90X+/One on One Hybrid program. I have had a lot of questions about P90X and thought one of the easiest ways to answer would be to write a concise review of each workout in the series. I can only say thank you Beachbody and Tony Horton for helping me get in the best shape I have been in for years. This short intro video is an overview of the series. It covers both the fitness component and the science and nutrition that went into the food plan and the supporting supplements. I watch it again every few weeks as a reminder and a little motivational pep. Push and Pull, alternating pushups and pull-ups or weighted exercises. This is a great workout. 12 exercises repeated for 24 sets. I was surprised how much I liked this workout since it only had 3 exercises that used weights, but it really pushes you to the limit. I really expected to not enjoy this workout. Yet it quickly became one of my favorites. Plyometrics is jump training - 30 moves repeated twice all in under 60 minutes. You will be dripping in sweat when you finish this workout, and aglow with the feeling of accomplishment. Here are fifteen exercises repeated for 30 sets in under 60 minutes. All but two have weights. I always feel great after this workout. You can feel and see results almost immediately. This is the only weight workout done in all weeks and all phases. It has 23 exercises so be ready to squat, lunge, and do pull-ups like you never have before. You will burn major calories while throwing punches, blocking and kicking. A very intense high energy workout. Is designed to help you reach a higher level of athleticism, prevent injuries and to help avoid plateaus. Used in recovery weeks or on your rest day as an option to keep active. Not nearly as difficult as X but still a good stretch routine to help keep the kinks at bay. I literally puked the firs t few times I did this workout. It is incredibly intense and because most exercises are designed to target two or three muscle groups simultaneously it will crush you (in a good way). 24 sets back to back, designed to work the whole upper body. This is my favorite of the original P90X workouts. My arms always feel massively pumped after this workout. Pushups, flys, dips and more. An awesome routine. Another routine of 24 different exercises. A pull-up, a tricep exercise, then 2 bicep exercises. Tony Horton has created some awesome workouts, and this is one of the best. This is a low impact cardio routine that is fun and will have you burning calories. It is used in the Lean and Doubles version of P90X or as an alternate for Plyometrics if you need it when starting. This is an advanced version of Kenpo X with new moves to help you reach your ultimate fitness goals. This upper-body workout will work all your muscles from the hips on up in a completely new way. This is a great workout, and doing a traditional P90X+ you do it twice a week. 20 exercises most done for 60 or 90 seconds straight. This one did not really do much for me. 21 Exercises designed to work the whole body. 20 Exercises designed to take your abs to the 6 or 8 pack range. Yet you will really need to have a chin-up bar. Many of these exercises cannot be modified for use with the bands. Tony Horton is a master motivator. His workouts keep you interested and coming back day after day. This is an excellent how-to fitness program. It is exciting and diverse enough to be challenging and to keep you motivated. For the most part the video's have 4 audio options also, normal Tony talking throughout, music off, music and cues and cues only. 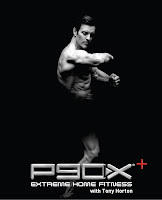 There is also a great video series on You Tube on the making of P90X. But what really matters is getting active, being healthy and making wise food choices. I will keep posting at the end of each phase and as I try new workout videos from Tony Horton, Beachbody and others. 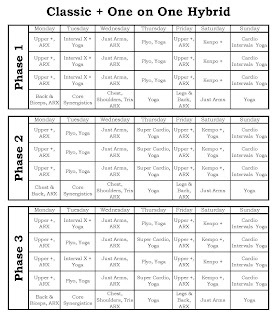 To the right is my current schedule I am in week 3, and you can download the workout sheets here. visiting schools in America. The visit coincides with PS87's multicultural day. The problems begin when the gang, Hank, Frankie, Ashley and Yoshi try to make enchiladas and the task of reading the recipe falls on Hank. With his dyslexia he struggles with the fractions, and the enchiladas end up with a lot of zing. Once again Hank learns that telling the truth is the best way to go. A good story in a great series. In this insane workout Tony Horton Does 24 Sets, 30 reps for pushups and 15 for pull-ups. He does twelve different exercises repeated for a total of 24 sets. After completing P90X and over 100 days in a row of working out with Tony, this program crushed me. To me there is a little too much talk and too long a break between sets, but I can't keep up with Tony. Fortunately he says to modify and pick your numbers. Also I use the bands for pull-ups because of a shoulder injury, so I swap it out with the 30 and the 15. I did manage 15 pushups for all 12 sets and 20 pull-ups. 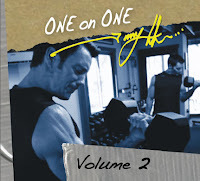 One on One with Tony Horton is a workout series that you can either choose individual workouts to purchase or on a subscription where you get a new DVD each month. It's just Tony mostly working out in his home gym at his pace. There is less talk and instruction than his standard series and it moves at a quicker pace and has fewer breaks. They are also intended for people in good shape already, or graduates of Power90, P90X, or other Beachbody or other fitness programs. As much as I love this series, some of the inconsistencies in the story line are starting to get to me. I have documented in other reviews inconsistencies regarding Hank's statements of his best mark in school. This time it is something different. In this one the principal of PS87 is talking outside the school to Hank's grandfather about peer tutoring and how it might be good for Hank with his learning difficulties. However in book 11, The Curtain Went Up, My Pants Went Down Hank goes through peer tutoring to improve his marks so he can be in the school play. These are great books especially for children with learning disabilities. Yet these story line inconsistencies are starting to detract from the strength of individual books. In this one Hank learns that his parents are having another baby. All he can see is how this is going to ruin his life, starting with his birthday party that very weekend. Hank makes two major decisions in this book. First he decides that looking after a pet might help him learn how to help with a baby, so his Grandfather papa Pete buys him a Mexican red-knee tarantula named Rosa. He soon finds out a tarantula can cause all kinds of difficulties especially in a pizza parlour. He also decides to throw himself a birthday party, but neither of his best friends can come because they made commitments to go with Hank's mom to look at baby carriages. This is another fun light adventure in the Hank Zipzer series. I really enjoy the two DVDs from Tony Horton's One on One series, Patience Hummingbird and Fountain of Youth; both are excellent. I picked this one up for some more variety and to give it a try. It is a little dated - it came out in 2004, before P90X. It is a good workout. There is a little kempo, and a little cardio. It is 35 minutes, and I am planning on working it in regularly as an extra workout. Tony mentions in the video that it can be good to start the day if you are really stiff, or to end the day. As I said, the video is a little dated, but working out with Tony on a beach in Hawaii, with the sounds of the waves and the surf, helps enhance the workout. I do personally prefer the One on One workouts but as Tony often states: 'different is good', and this adds one more workout to my catalog. Want to be in better shape, feel the need to de-stress? If so, in this article we will look at the pros and cons of three fitness programs from Beachbody.com and how they can work with your student lifestyle. This article is a follow-up and continuation of my four-part series on my personal lifestyle change using P90X. We will examine 3 different programs from Beachbody and how they can be used to continue P90X or on their own to help bring a greater level of fitness to your life. 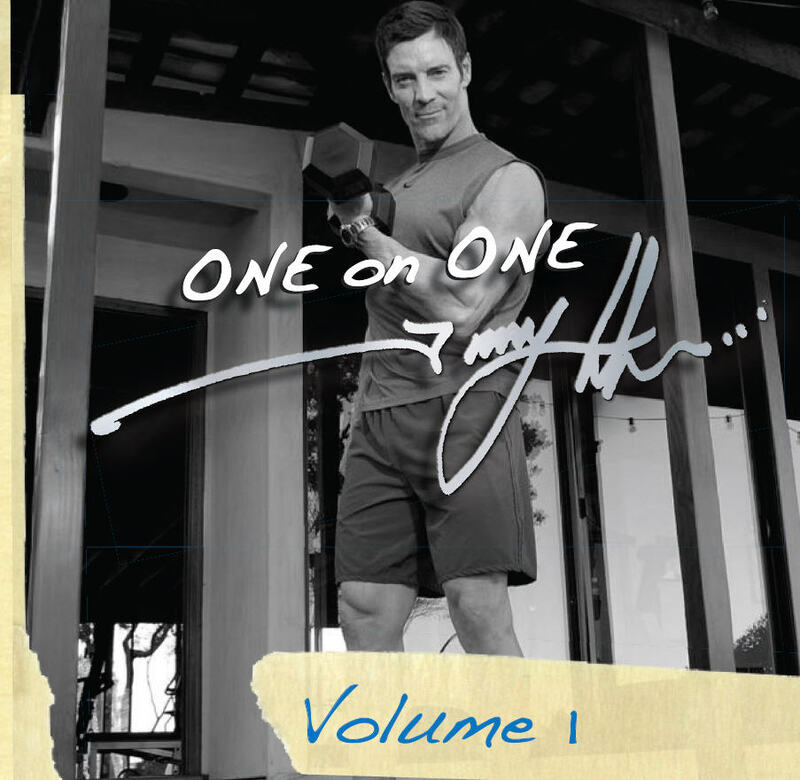 We will be examining One on One with Tony Horton, P90X+ and the 10 Minute Trainer. As a disclaimer, I have not done the full program for these series but I have done each of the workout videos at least once. All three of these programs are hosted by International fitness sensation Tony Horton. Last year at one point, P90X and 10 Minute Trainer were both in the 50 top-selling infomercial products; currently P90X is number 1 after 6 years on the market according to industry tracker IMS (Infomercial Monitoring System). 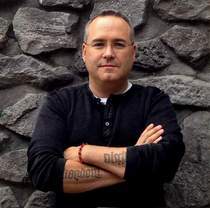 Tony has, over the last 20 years, established himself as one of the premier personal training experts. He has worked with such stars as Tom Petty, Billy Idol, Sean Connery, Annie Lennox, Jason Scheff, Rob Lowe and many others. He is a little quirky and a little verbose but his workouts get the job done. The workouts are hard enough that you can get great results, but enjoyable enough that you keep hitting play. At the writing of this, I have hit play over 100 days in a row and worked out with Tony through his DVDs. The advantage of this series is you can buy just a few to start and add to your collection over time, or join the subscription service and get a new one each month for less than I spend on coffee in a week. These are heart intense workouts - just Tony in his home gym or on the road, doing the workouts he does to stay in shape. My favorites are Just Arms and Diamond Delts. These advanced workouts are for those already in shape and some require more equipment than P90X. But they are worth it. Most of the workouts come in between 40 and 60 minutes. They are filmed with 2 still cameras and 1 camera man following Tony through his routine and interacting with him. They are a lot of fun and full of new exercises or variati ons from other exercises in Tony's cannon. To be honest, I was very disappointed in this series. Having graduated from P90X I thought this would be a great way to take it to the next level. It adds 5 more workouts to your collection and they become the core, and the original 12 workouts from P90X supplement this regime. 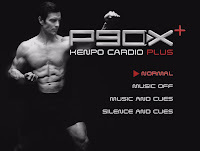 The new workouts are Interval X Plus, Kenpo Cardio Plus, Upper Plus, Total Body Plus, and Abs Core Plus. The problem is you absolutely ne ed a chin-up bar for some of these workouts and for a few exercises you need Beachbody's specific chin-up bar. Nowhere on the product website does it have any information stating this. If you did P90X using exercise bands, you're out of luck or need to figure out the modifications yourself. The other disappointing thing about this series is this: in the original P90X Tony works out with 3 other people in each video and most people are in 2 of the 12 videos. For P90X+ it is the same 2 people for each of the five video s. Where are Pam, Dreya, Joe, or some of the others? My final criticism is the feel of the videos. 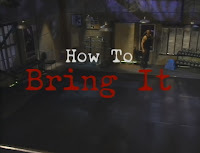 They feel like infomercials; you are constantly being sold the Tony Horton Power Stands, the Chin-up bar, Bowflex Select Tech dumbbells (which Tony uses and raves about in this series but in his home gym on the One on Ones he uses traditional dumbbe lls), and then the supplements. However these are good workouts. Th ey are intense and do take P90X up a notch, but I really think a better continuation of P90X could have been done, by using more workout partners, by offering modifications like in the original P90X and by being less sales oriented. After doing P90X these videos seemed a little cheesy, but after doing each of them I have an even greater respect for Tony Horton. He packs a lot of punch into 10 minutes. These videos can either be done alone or stacked. I have met some people online who do one in the morning and one in the evening. If you use the warm-up on the videos you are looking at under 15 minutes. If you do your own you can cut it down a little. Yes you can achieve results in just 10 minutes of hard exercise a day. You basically do 10 exercises for a full minute; most of the exercises are selected to work multiple muscles at a time. The Abs program crushed me my first time through. When you buy the kit it comes with an exercise band and a door attachment so you have everything you need. It also comes with workout cards so you can do the workouts on the go without the videos, rapid results guide, 10-minute meals and more. I have met people in the teambeachbody.com forums and chats who have lo st up to 60lbs using this program and the nutrition guide that comes with it. For the extremely busy student this might be a great choice, especially if you cannot squeeze 60 to 90 minutes from your day for P90X. All in all it is a good workout series but not my cup of tea. The other really nice feature is, on Tony's blog every so often, he posts up the exercises to create a new 10 Minute workout. Tony has created numerous 90 day boot camps that can be done in your home. He is acclaimed as a fitness expert and based on the stars and athletes who have used his programs he is definitely a success. But what matters most is that you make a choice to live a healthier lifestyle, learn to make better choices and start moving with one of the workouts outlined above. It will help give you a start at a lifetime of learning to be healthier and to get fit.